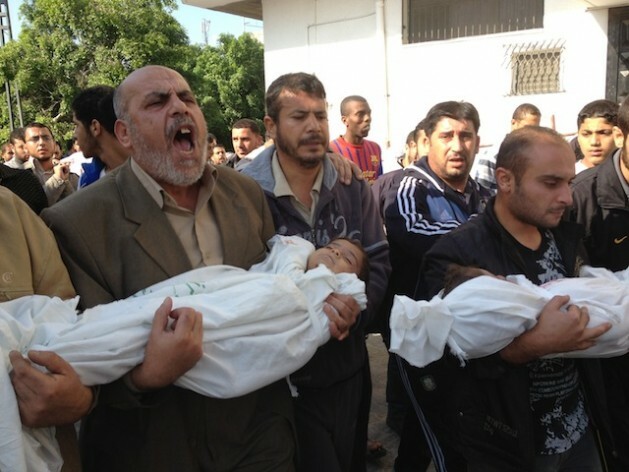 A funeral procession for two children killed in the Israeli attacks on Gaza. Credit: Mohammed Omer/IPS. GAZA CITY, Nov 22 2012 (IPS) - Fouad Hijazi was watching the 7 p.m. news with his wife and eight children when a missile fired by an Israeli F-16 hit their house in Jabalyia refugee camp, Gaza’s most densely populated area. Fouad, 46, was killed. So were his sons Mohammed, 3, and Suhaib, 2. Fouad’s wife Amna is in Shifa hospital, and her two daughters and four other sons are also in the hospital. Eighteen others from the neighbourhood were injured in the airstrike. Following the airstrike, two firefighters and a rescue team worker were wounded when a wall of the home fell on them. Neighbours told IPS that Fouad Hijazi did not belong to any militant group, nor has any organisation claimed him as a member. Relatives took the dead for burial at the Jabalyia cemetery on Wednesday. Bodies are usually brought home from hospital for a last farewell. In the case of the Hijazi family, there was no house left to take them to. “Just an ordinary man, sitting peacefully with his wife and children in their home. What did they do to deserve this?” cried Umm Mohammed, a cousin of the father. Israel says it has hit 1,450 targets in the Gaza Strip since assassinating Hamas’s most senior military leader in a missile strike on Nov. 14. The eight-day attack killed 162 Palestinians, including 42 children – the youngest aged 11 months – 11 women, and 18 elderly persons, the oldest 82 years of age. In all 1,222 have so far been listed as injured, more than half of them women and children. Rockets fired from Gaza have killed five Israelis. Israel’s airstrikes have hit several locations in Gaza Strip. The targets have included civilians’ houses, apartment blocks, most of the security units, the ministry of interior office, prime minister office, police stations, roads and bridges connecting camps, naval forces, and journalists offices and media centres. Three journalists have been killed, and eight injured. Israeli leaflets were dropped asking the population to leave their homes all over northern Gaza Strip: Beit Lahiya, Beit Hanoun, Atatra and surrounding locations. Women and children have been heading to UNRWA (United Nations Relief and Works Agency) schools for refuge after fleeing the northern Gaza Strip. Refugees are sleeping on the floor at these centres. Sada Assaf, 41, said she fled her house with her two children, her ill husband and his eight children from a previous marriage. “We got this leaflets dropped on our heads, following very intensive days of artillery shelling,” Assaf said. She sits in a classroom at Gaza Prep. School for Boys with her husband and children, listening to the news on a tiny radio and hoping the ceasefire will hold. The whole neighbourhood of Al-Attatra in the north of Gaza fled. The UN says that thousands of people fled to 12 school buildings in the area. “It happened before in 2008, and here we are once again,” said her husband Salah Assaf. Back then Mais recalls many of her neighbours were asked by the army to evacuate, and later Israeli tank shells killed at least 40 Palestinians who had sought refuge at this very centre. That massacre boosted international groups’ call for a halt to the war on Gaza. The families at the centres are drawing hope from the ceasefire that appeared to be holding. In the early hours of Thursday morning the skies fell silent over Gaza for the first time in eight days. Gunfire erupted on Gaza streets – it was Gazans celebrating the announcement of ceasefire and victory for Palestinian resistance. Sada Assaf was looking for the donkey cart that had brought her and her family to the shelter, to now take her back home. As long as those in the Gaza continue to let the terrorists set up their launchers in residential areas they deserve what ever happens! !These people target civilians with their rockets!The Israelies have shown a lot of restraint!! How long are we, International community going to let this brutal force of occupation get away with all these war crimes and tolerate these permanent agressions and provocations from the Israeli Occupying Force upon the Palestinian people ? In the name of what ? International Laws are supposed to be for everybody. Injustice and Impunity kill. Trinity, please cease parroting Zionist lies. Gaza is a crowded walled concentration camp. The lie you post here was also spread by Israel’s propagandists after Israel mass murdered 1400 people including 350 children (and wounding about 7 times that number) in the 2008 slaughter dubbed Cast Lead. That lie was discredited bu Amnesty International anf the international Red Cross and other more creditable institutions than Israel’s criminal psychopaths. Does this look like Israel took precautions to protect civilians? This is a war crime! How about this? Does this look like civilians are being considered?